So I've been getting these emails....."Where are the Christmas Inchies?" So here is my first version. I also have another one I'll post next week in traditional Red and Green. This one has a bit of sparkle to it and unfortunately that doesn't show up so well in the scanner. You can click on the photo for a closer look. He sent me a game to try out with the kids and is also sponsoring this week's giveaway. 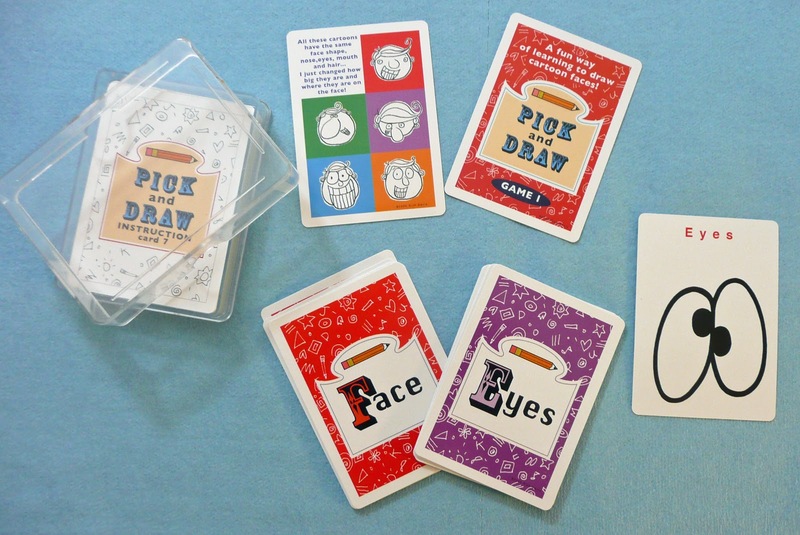 Pick and Draw is a card based game that you can play alone or with a whole classroom of kids. 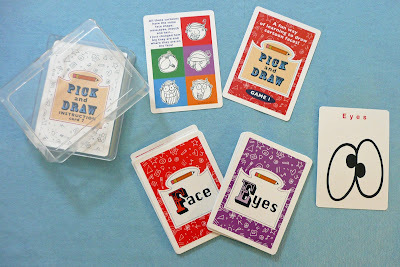 Because it's a game it works well as an icebreaker and helps kids gain some confidence with drawing. It's also a great way to fill in those extra 15 minutes or so. My kids had a blast! Stay tuned to the end of the post for the giveaway details. 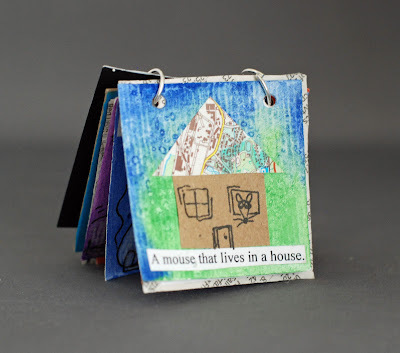 - 9 small squares of wc, cardstock, or heavy sketch paper, we use twinchies 2" x 2"
Like I always say with Inchie projects just adapt and use what you have, it's amazing what you can come up with. I usually start off doing all the backgrounds first. 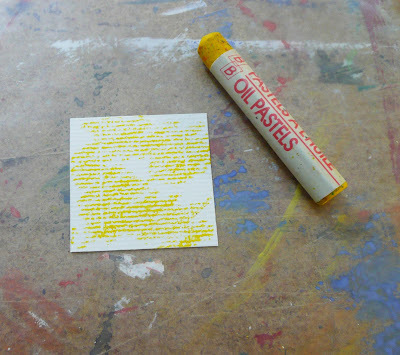 On one square color it a bit with the yellow pastel. then paint it with some gold paint. 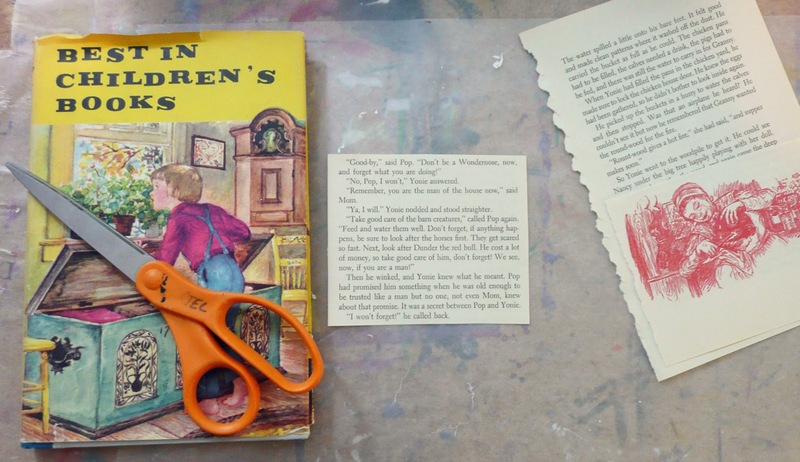 Take one of the squares and glue it to the old book page, trim away the excess. 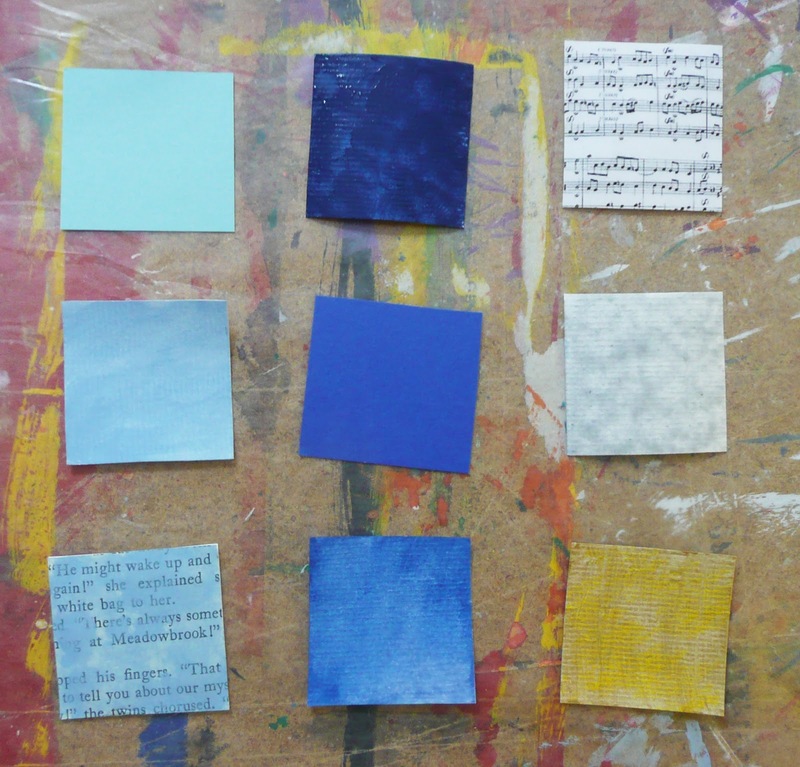 Do the same thing with another square and the sheet music. 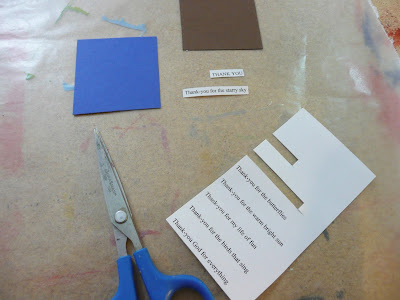 Cut a square out of the light blue paper and the dark blue paper. Paint a different square with the light blue paint. Paint another with the dark blue paint. Paint one silver. 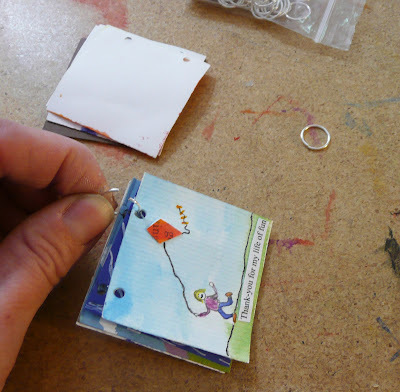 You can also add a little silver paint to the sheet music square. Add some light blue paint to your book page square. Finally take the last square paint it with the dark blue paint and then sponge on a little of the light blue. You can also add some stripes. 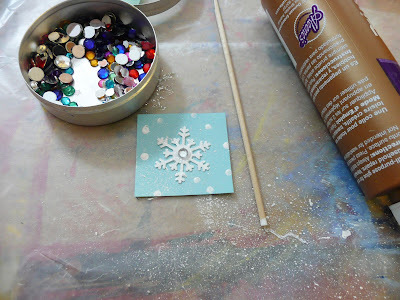 For the snowflake square I used a punch I had but you can use a large sequin or cut one out of white paper. You could also paint or stamp one on. I also added some silver glitter glue. I always use paintbrushes with glitter glue and paint it on otherwise the kids will put gobs and gobs on and it will take forever to dry! Taking a skewer or the end of a paintbrush dot on some white paint. Glue on a little embellishment if you have any (piece of ribbon, sequin, gem). For the mitten square, take the silver painted Inchie. 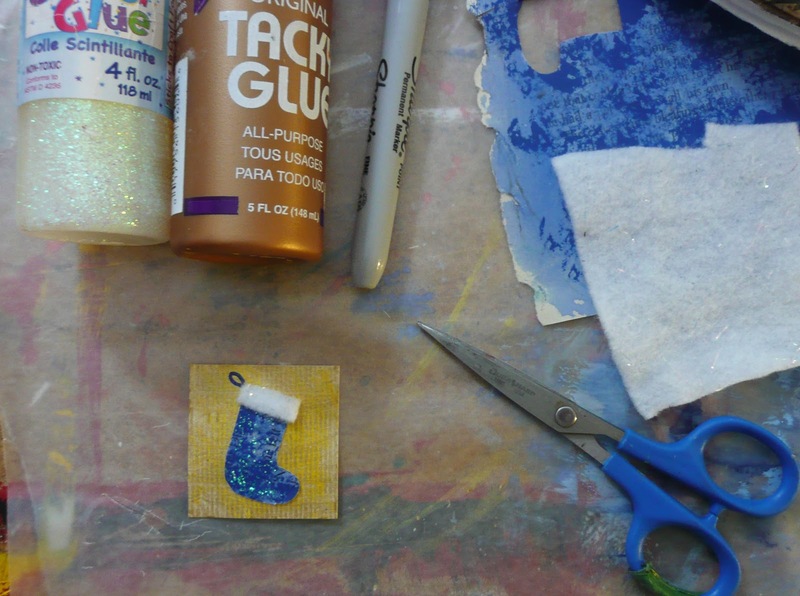 Add some glitter glue to the square for more sparkle. Cut out 2 mitten shapes from the dark blue paper. 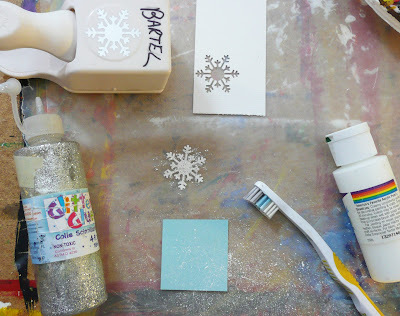 Add some decoration to them with the white gel pen. Glue into place and then draw the string with the a blue sharpie or marker. Take the Inchie you painted dark blue. 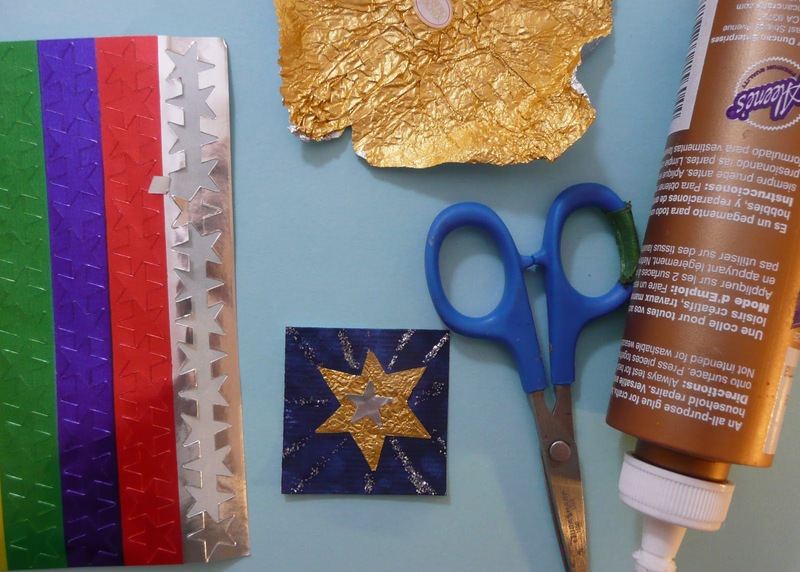 Cut out a star shape from some gold paper, foil, or like me a candy wrapper. 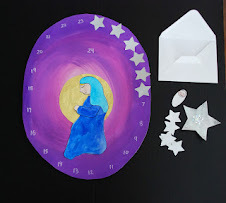 Glue onto background, add some glitter and a star sticker. For the candle square take the sheet music Inchie. 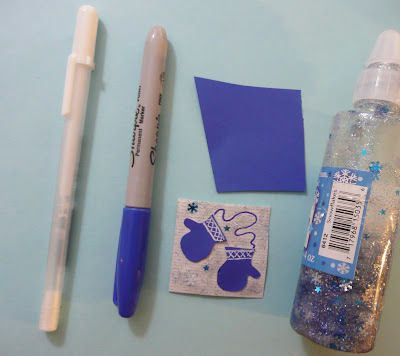 Cut a little candle out of blue paper or use paint/colored pencils or markers to draw one on. 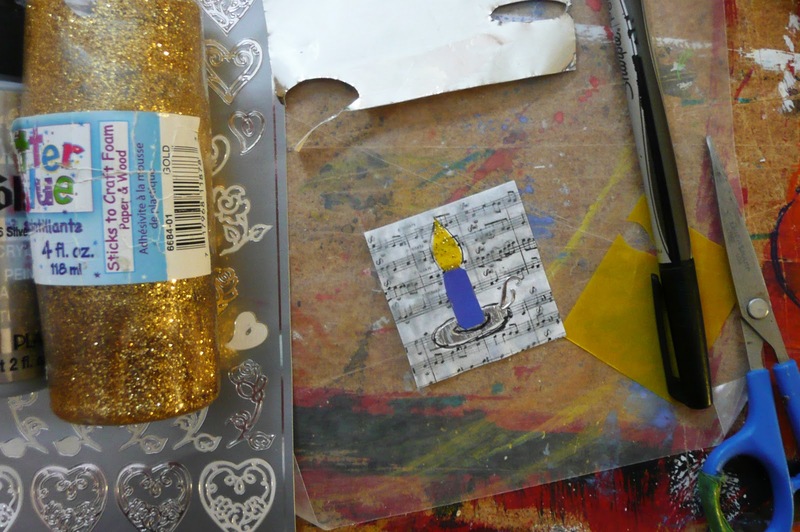 Make a flame out of yellow paper and a candle holder out of metal tape or foil. I used a little sticker I had for the handle. Outline it a bit with fine sharpie and add some glitter to the flame if you wish. For the Angel Inchie take the dark blue paper square. 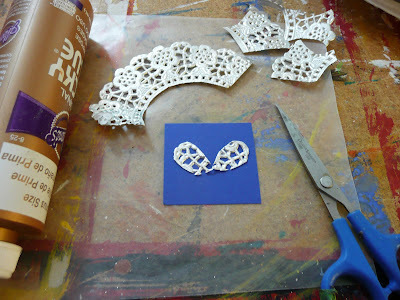 Cut 2 little wings from the doily. Glue in place. Cut a triangle from the white felt. Glue in place. Cut a circle from some scrap paper. Draw on some eyes and a mouth. You can add a little blush with a pink pencil crayon. Glue in place. 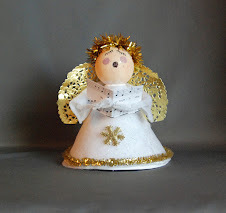 For hair I used a small piece of wool and then a gold thread tied in a circle for a halo. Use whatever you have on hand. The present square uses the light blue painted Inchie. 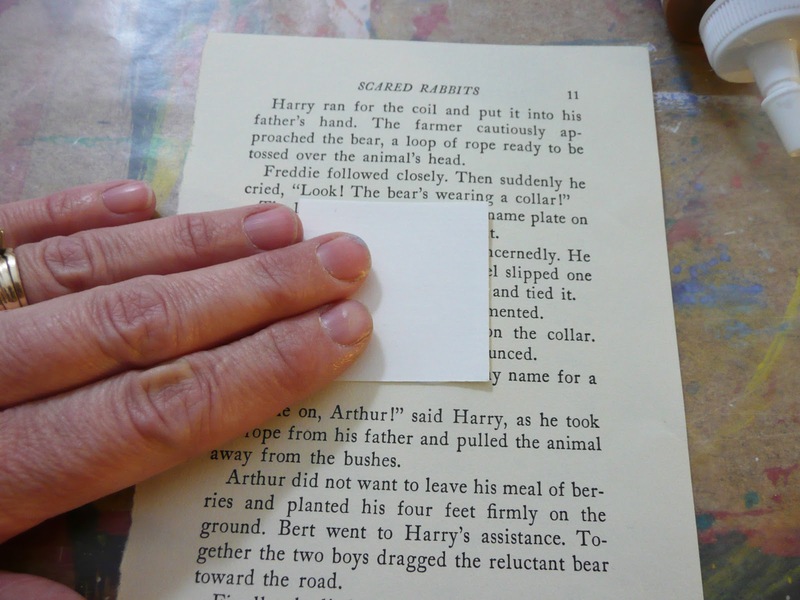 Cut a small rectangle out of white paper. 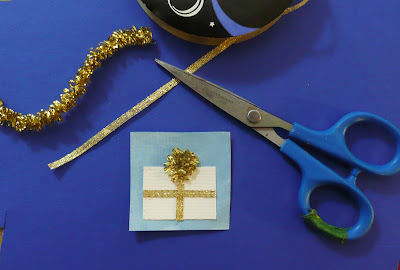 Glue on some ribbon or paint it on with the gold paint. 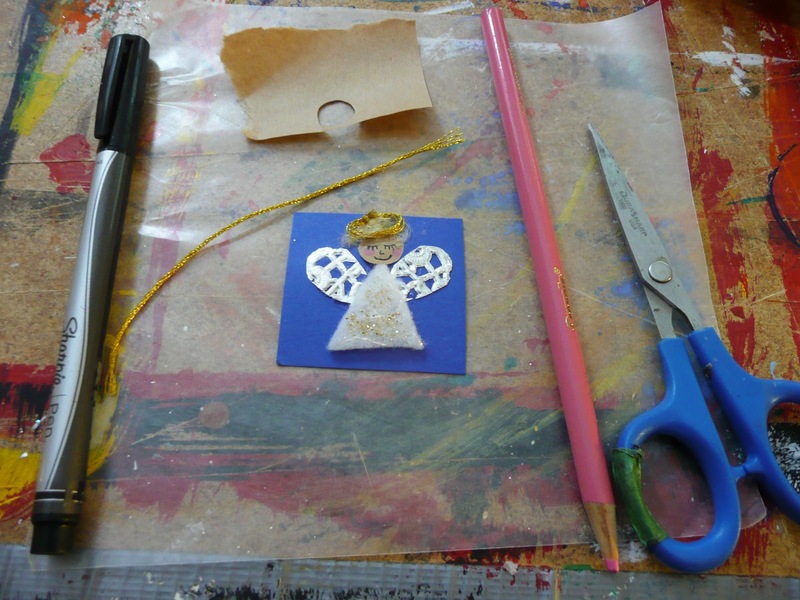 Add a scrap of tinsel wire for the bow. 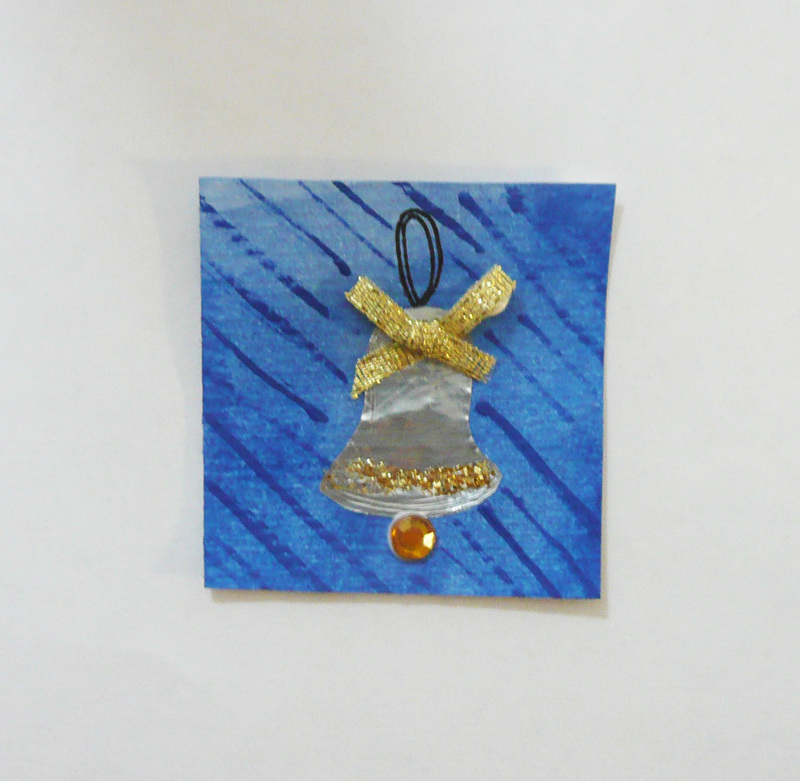 On the gold Inchie I glued on a stocking shape I cut from some blue painted paper I had in my stash. I trimmed it with a small piece of felt, added a loop with the blue sharpie and painted on a little glitter. The snowman is my favorite. 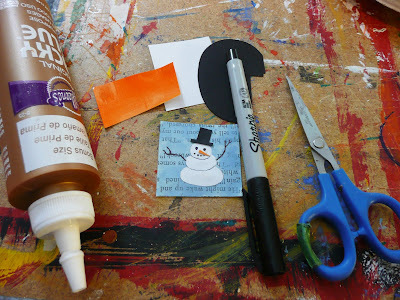 I cut out a snowman shape out of white paper. 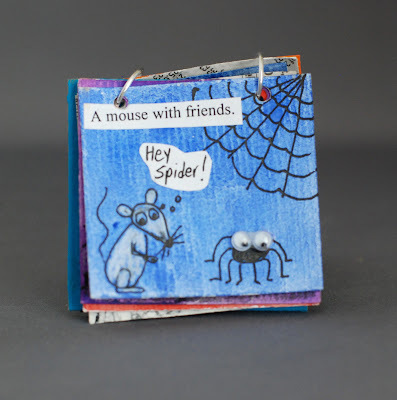 Glued it to the blue painted book page. Cut a little hat out of black paper, drew on some arms, eyes, and a smile with a black sharpie and then cut a carrot nose from orange paper. On the last square cut a bell shape from the metal tape. Add a gem for a clanger. I added a little piece of ribbon and some glitter. That's it. 9 different Inchies, each one can easily be a large art project on it's own if you wish. 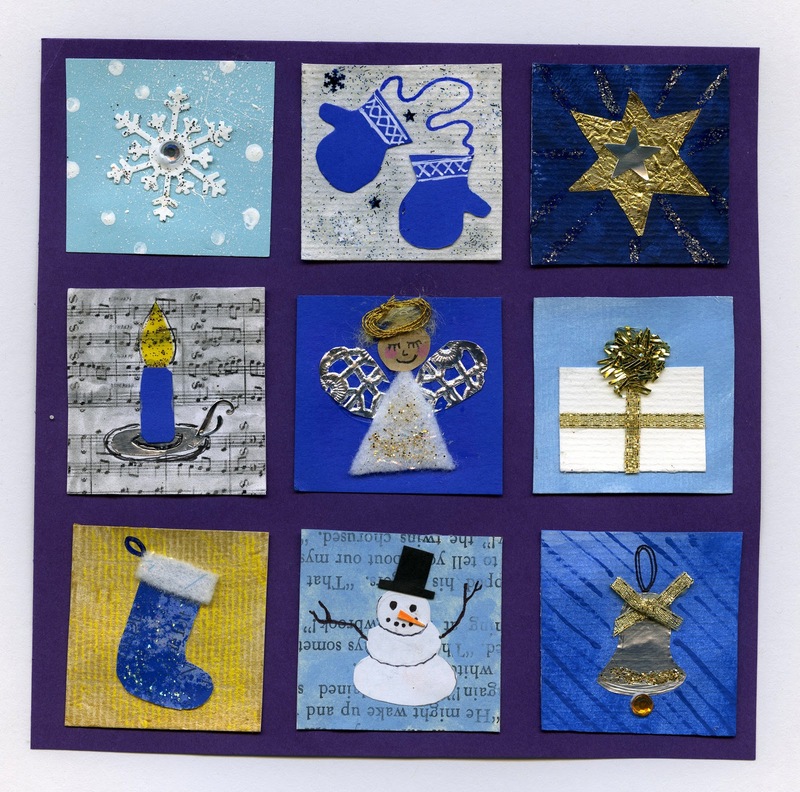 I was recently at a school that did my Fall Inchie project only they made only 4 squares and each one was about 4" x 4". It was awesome! - like or comment on this post on my Facebook page. Enter by 11:59pm Thursday Dec 1st/11 and I'll make the draw on Friday Dec 2nd/11. U.S. and Canadian residents only. This is an art study project that will take a few sessions to complete but is very rewarding. There are 2 parts to it. 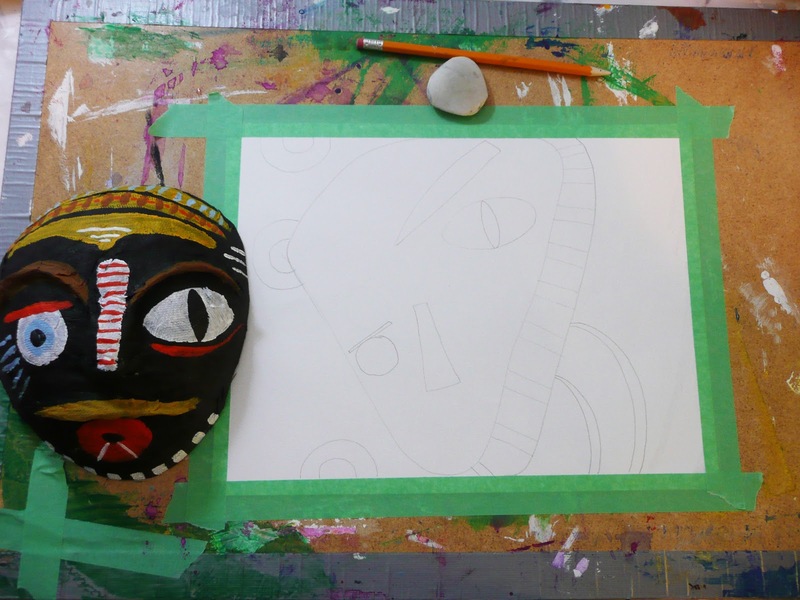 Constructing the mask and then after careful observation creating a painting influenced by the design elements of that mask. With a class you can have students reference their own mask or that of their classmates. 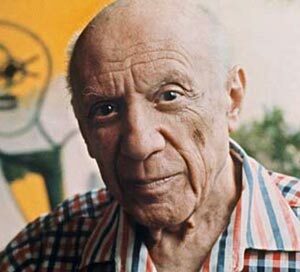 Before starting spend some time discussing Cubism and the work of Picasso and Braque with your students. This particular art project looks at the early stages of Cubism, (almost more expressionism). With Cubism, we are experimenting with form, stylistic distortion of form, and we are looking at the viewer's perception of that form. Take your balloon and blow it up to the size of mask you want. You can tape it to an old yogurt container if you want to assist in the drying process as well as making it easier to maneuver while constructing. Cut up your paper towel into strips. Mix up your white glue with some water (1 to 1 ratio) in an old recycled container. 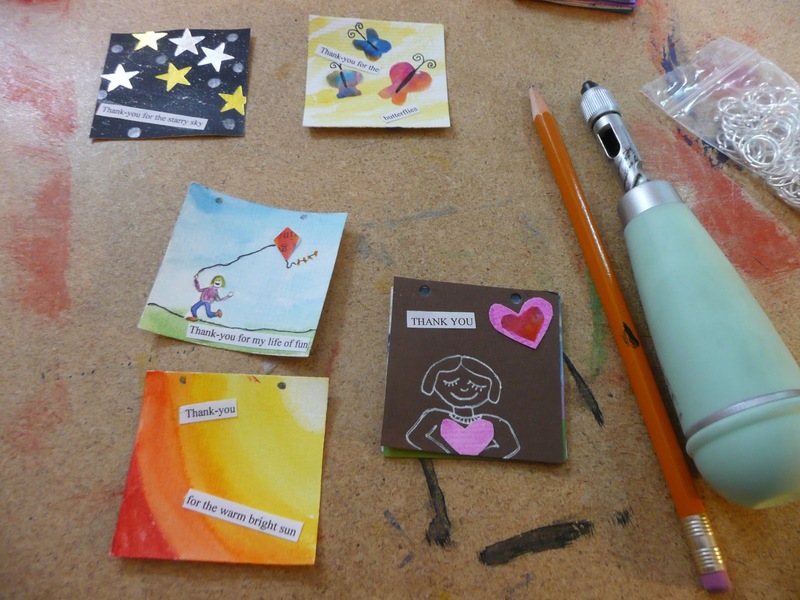 Place some wax paper on your work space. Start constructing your mask. 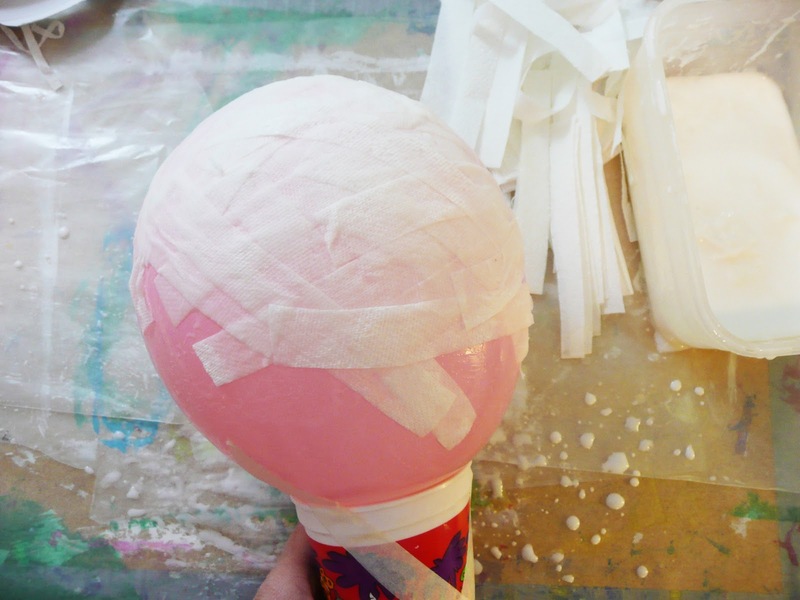 Put some strips into your glue mixture and apply to your balloon. Cross the strips over one another. You only need about 2 coats here. We only need 1/2 the balloon covered to make a mask. Every once and a while add a dry strip to soak up extra moisture as well you can soak up all that excess glue mixture on the wax paper. You want your mask to be moist not sopping. You can add some details to the face by adding rolls of paper towel and applying eyebrows, a nose, as well as lips if you wish. Leave upright to dry. 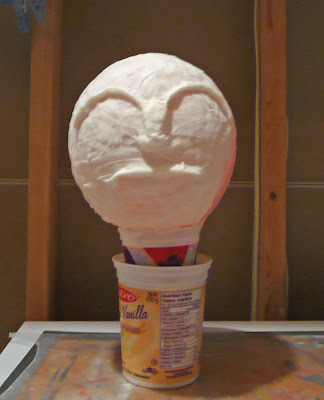 Here I placed the cup I had taped to my balloon into another old yogurt container. You might have to put some weight into the container to keep that balloon upright. When dry pop the balloon. Take a pair of scissors and trim away the excess strips to get a nice edge around your mask. 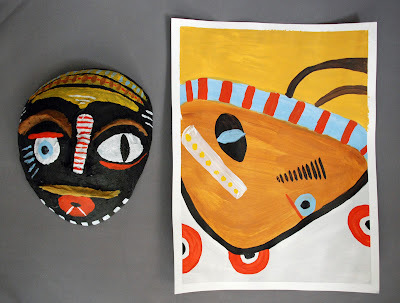 Take your mask and paint it with either acrylic or tempera. Try to incorporate design elements you saw in your reference material. Once the masks are completed you want to work on your painting. 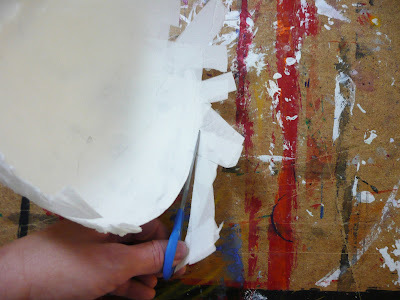 Tape down your wc paper or heavy sketch to your art board. Using your own mask and/or ones by your classmates pick out specific design elements (lines, shapes, colors) and add these to your composition. Draw it out in pencil first. 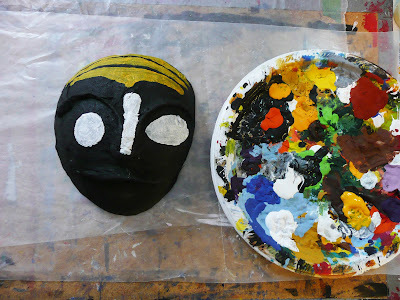 You're not looking to replicate the mask here only pull out elements that interest you and place them in a new arrangement. 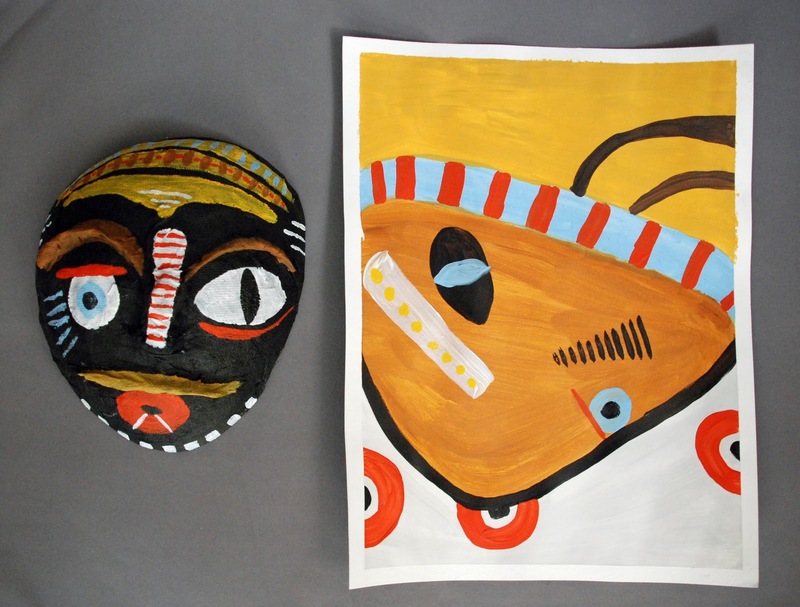 Display your masks and paintings together. 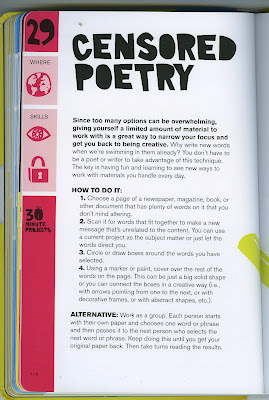 Give it a try, it's very interesting to see what features or elements the kids focus on. You already know that I love creating inchies with kids but did you know you can turn them into a little book. 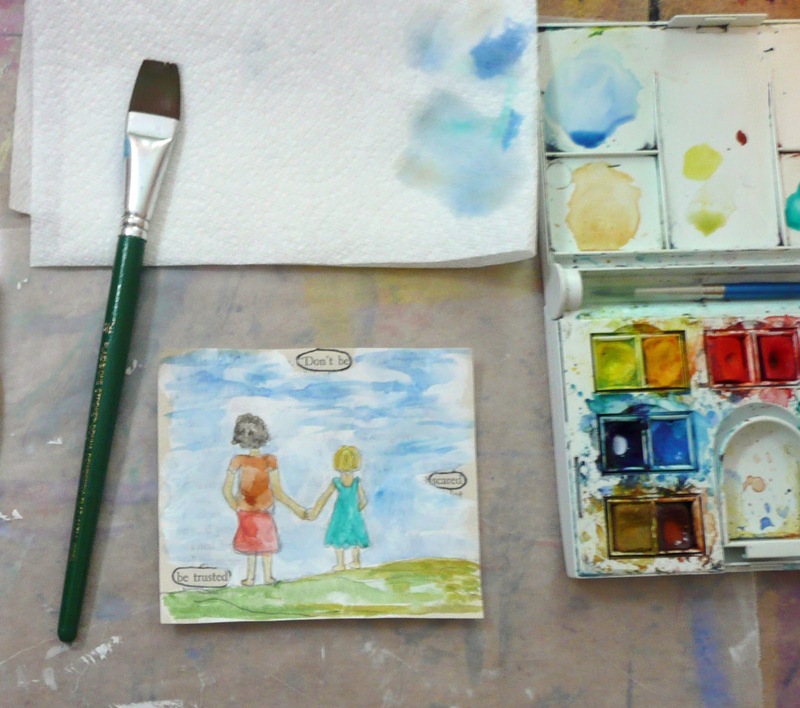 Kids love miniatures and inchies make perfect little miniature books. 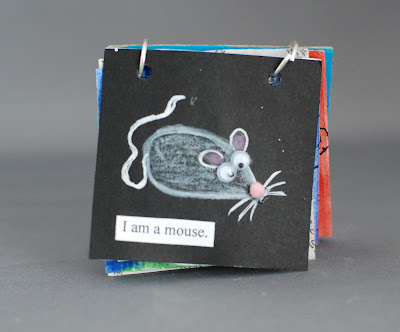 Here is a mouse one. and here is a Thank-you one. A Thanksgiving inchie book would be a great project for all of my US readers this weekend! 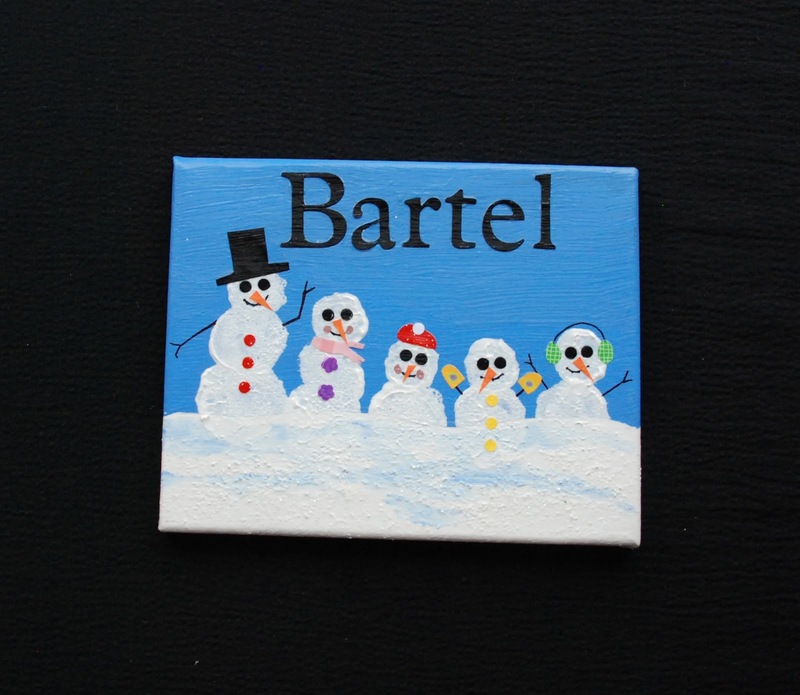 - any little embellishments, googly eyes, fancy papers, sequins, etc. 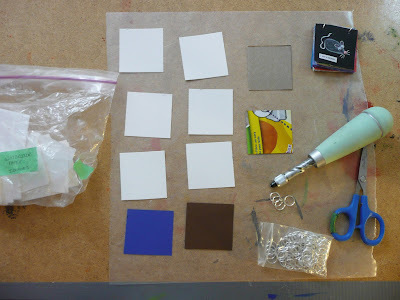 You can make your inchie squares out of any paper. I tend to use wc paper as I like the heavier weight. Cardstock or posterboard works well as does manila tag. I cut a whole bunch and put them in a ziploc bag so I always have squares ready for when the mood strikes me. At school the teachers have a folder pocket filled with hundreds of inchies I cut (using the paper cutter) ready to go. Take a cereal or cracker box and cut an inchie for the base of your book. You can then paint it or cover it with paper glued to it. 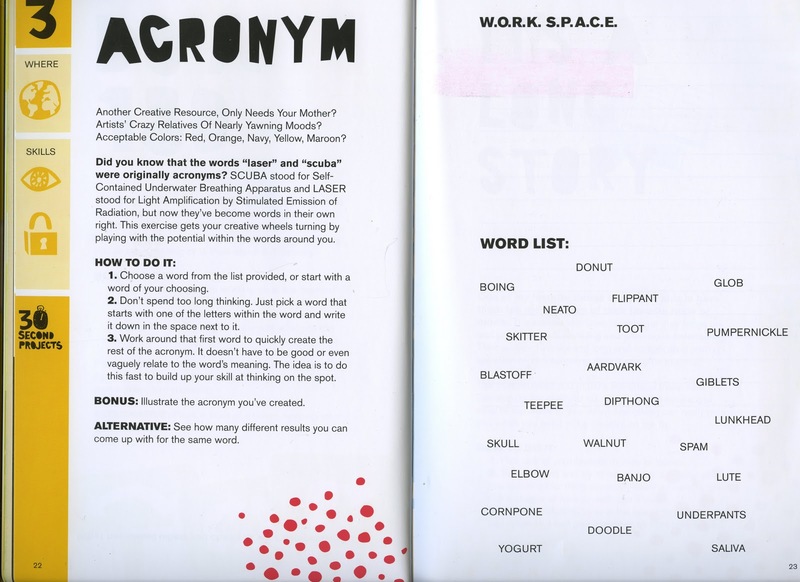 Now you probably want to write the text to your book first. 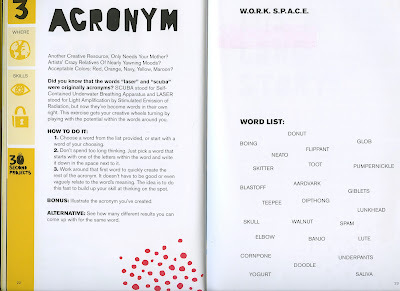 This helps you figure out how many pages you need and what the illustrations will be. Because the inchies are so small you might want to type it out on the computer first. Font size 10 - 8 works great. You then can cut the sentences or words out and glue on your pages as you go. Once your inchies are completed you need to punch 2 holes on either the top or the side for your binding. I have a little press punch but you could also use an awl. I punch the title page first and then use it as a guide. 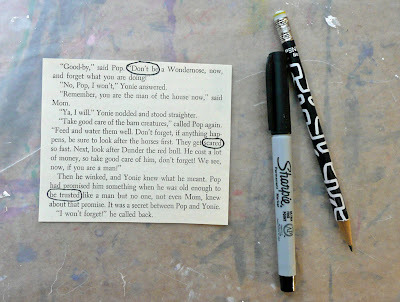 I'll put the next page under it and put a pencil mark thru the holes so I know where to punch on the next page. Those of you who make jewellery will know what a jump ring is. For the rest of you jump rings are wire rings that are split in the middle. You can easily pull them apart and then close them together again. I found a value pack at Michaels for about $3.50 that gave me 250 jump rings. You want a large size. These are 10mm. Walmart recently had some really large jump rings, 20mm, which work really well on larger book projects. Open up the ring and starting with the back cover put on the pages. I find it works best if you do all of one side and then the other. Close up the ring and there you have it. A cute little book any child would be thrilled to make! 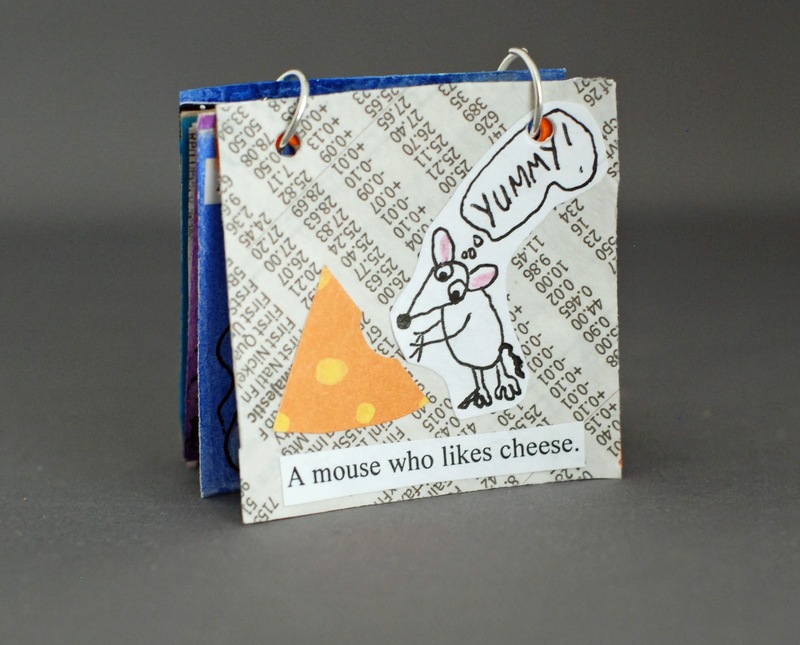 This is just a few of the pages from the mouse book. . 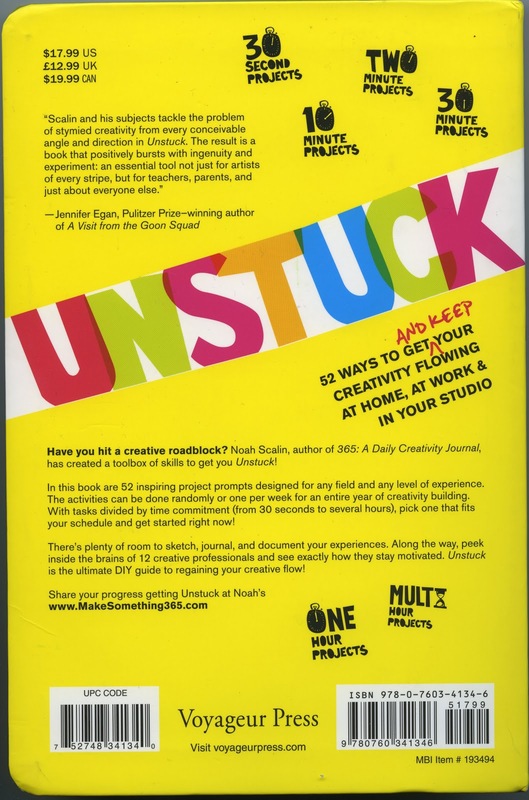 I had 82 entries for Noah Scalin's new book "Unstuck". Congratulations Cindy! It's a wonderful book. Hope everyone in the US has a great Thanksgiving and I'll see you next week with more art project ideas. For this week's giveaway I want to introduce you to a book called "Unstuck" by Noah Scalin. I was sent a copy to review by Quarry Books and I am truly amazed by this book. You can check out his website "Make Something 365". 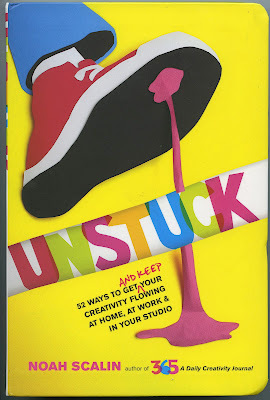 Inside you have 52 projects or ways to get you to start being creative. Things you may have never thought of before, interesting ways to do things, and great writing/art prompts. 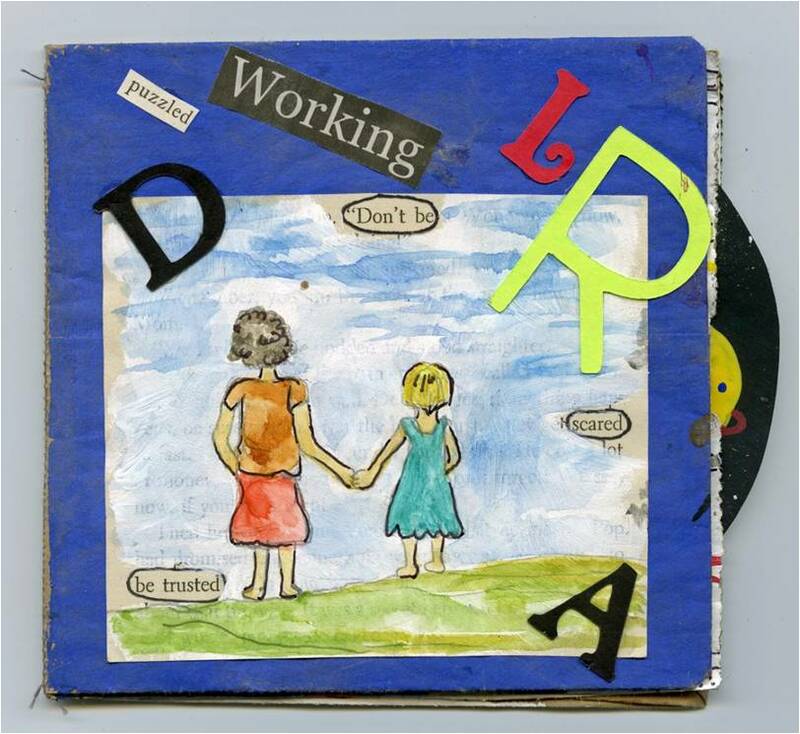 When I was putting together my "Writing and the Visual Arts" session with my colleague Kim McCullough we kept going back to this book saying "Oh we could do that, or that , or that". 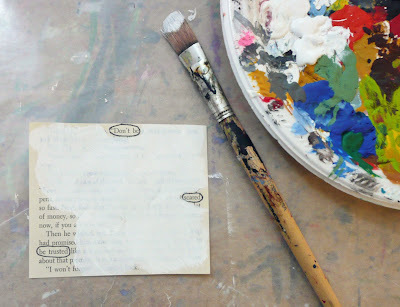 In the end we only talked about Blackout Poetry which I have done many times. 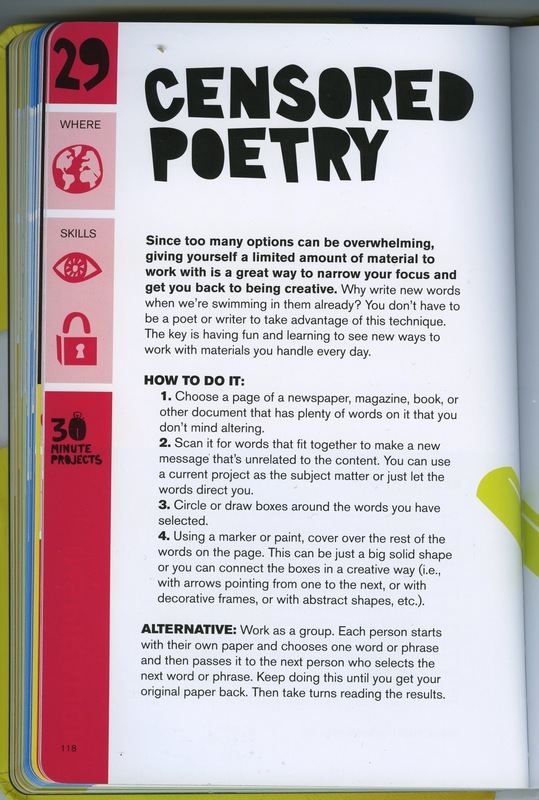 The point is every one of the 52 ideas in this book can be used as a basis for a larger art project or as a quick creative exercise for your classroom. I have a waiting list of teachers at school wanting to borrow this book so you know that's a good sign! 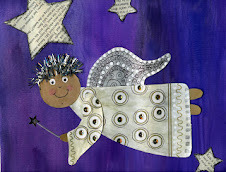 Here is one of the projects that I can envision as a larger art project. You could pair this with any subject in your curriculum by selecting words on that given topic. (for example Bears in Grade 1). They then create an art project to go with that Acronym like a poster promoting Griz the Wonder Wrestler appearing in his next bout. They can also springboard this into a story about how maybe Griz is tired of the wrestling life on the road and just wants to retire to the mountains. You get the idea....and now you know why Kim and I were so excited by this book. So this is the page that describes Blackout poetry. I have done this type of project a lot and it's one of my usual exercises that I do with teachers when I'm conducting a workshop. So here is a blackout poem I did on a paperbag book that was a project at a recent conference. Find some old books. I love to use old Nancy Drew, Hardy Boys, and Bobbsey Twins books. They have great paper! You can find these at garage sales, used book sales, discards from the library, they are everywhere. I also like these books (see photo) or old reading texts. You can easily photocopy pages that you want to use over and over again. You can also enlarge the print. Cut out a section of print at random. 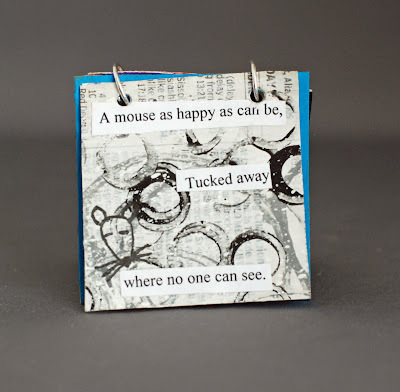 Read through the print and circle in pencil words to make up a poem or sentence. We always start in pencil because as you ponder you might come up with something better. When you have settled on a good poem go over the circles in fine marker. 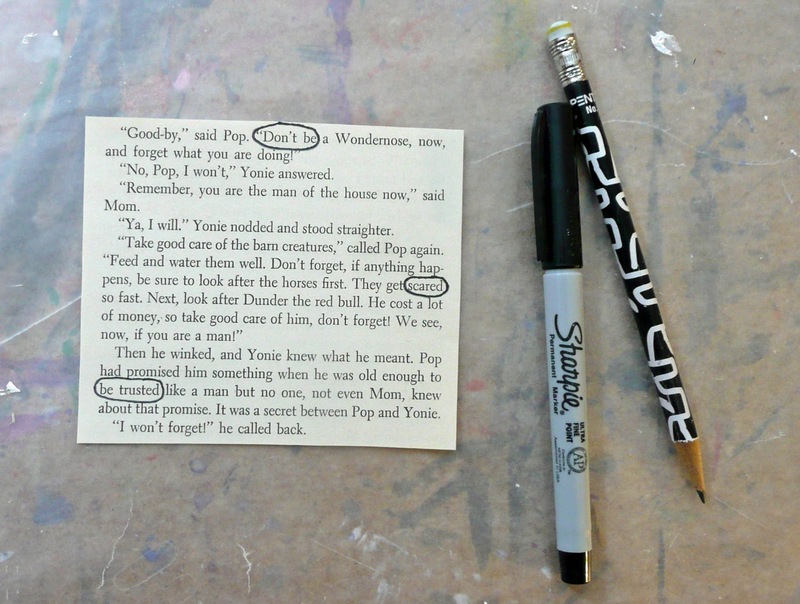 Take your white paint and paint over the text except for the words you circled. You see how with young kids you may want to enlarge the text here on the photocopier! It's a nice effect if you allow the words to show thru a bit, it reveals the process to the viewer. Now using the white space draw an illustration that goes with your poem. 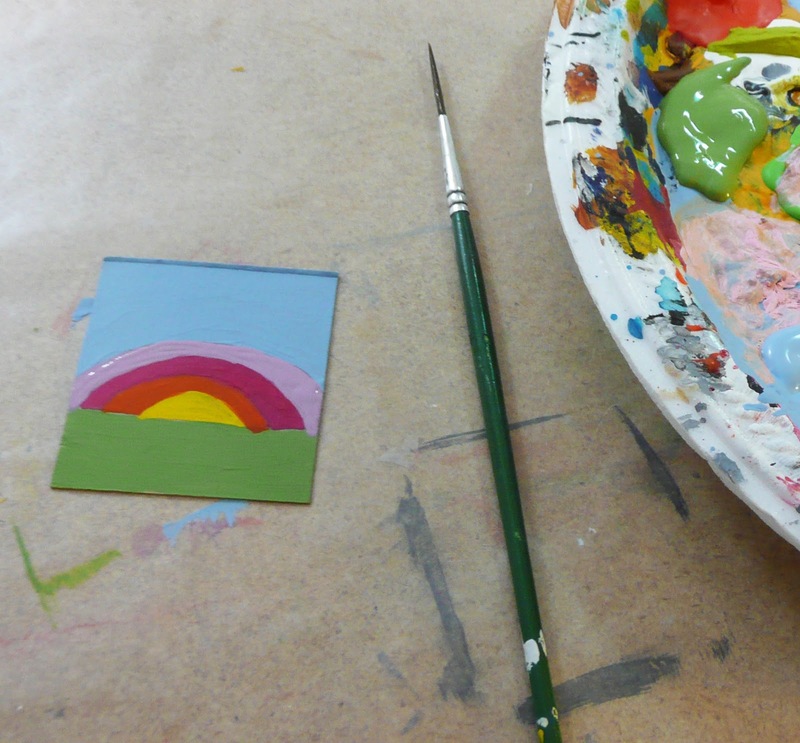 Using your medium of choice add some color to your drawing. Finally you can seal this mod podge if you wish. Honest to Pete.... I picked this page at random and was able to come up with...."Don't be scared, be trusted"
Pretty amazing what you and your students will come up with. 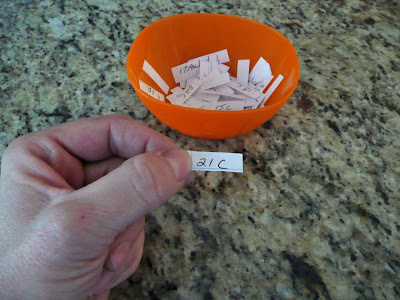 You have until Thursday Nov 17/11 midnight and I'll make the draw on Friday.